Theatre Club began in 1992 as an activity for all ages in our Church family at Wesley Hall. We began very modestly. There were about 16 or so of us, some of whom had sung in the choir, some had read poems, some could play an instrument and others just wanted to come along for the social occasion. This was fine, this was what it was all about. Sandra and I had talked about starting something like this and she was as eager as me to get things going. I looked for short sketches to read and she found the music for some choral pieces. Ivor Mann, our Minister at the time, said he could play the euphonium and with some solos from various choir members and a poem from me, we had our first programme. We had no stage lighting or sound. Everyone had to PROJECT their voices, which is something I tried to instil all through the years in case the microphones went down. Philip pulled the curtains – that was as technical as it got! The first Concert went quite well, but I think that most people thought that this would be a ‘one off’. I soon realised that if we were to continue as a Club we would have to be working towards a common goal – a performance, to keep us all together. Our second Concert brought us a few more members and our confidence was growing. We were asked to take the concert to Forest Hill Church for an afternoon performance. I don’t think that they expected so many of us to turn up during the day. We squeezed into the vestry in the old church which we were given for changing and performed on the tiny platform in the hall. During the interval we ate most of their refreshments. We were growing. Small children were blossoming and becoming confident. All the Watkins family and the Price, Barton, Dowsett and Holder family have grown up with Theatre Club and some cannot remember Wesley Hall without it. In 1995 we celebrated the 50th Anniversary of VE Day with a ‘Street Party’ in the Hall. We decorated the place in Red white and blue and had long tables down the length of the hall. Paste sandwiches and jelly and blancmange were served and we entertained on the stage with Wartime songs and sketches. I think this was a turning point and we began to get a regular following. Jack started off our sound system with some stand microphones which helped with some of the small voices who had joined us. More lights were shining and scenery was getting bigger and bolder. It was around this time that Chris joined us, and improved on the sound system which Jack had started. We were now producing shows of quality with good lighting, sound, scenery and costumes. How lucky we have been to have had such a brilliant Production Team. Margaret P is always unflappable and comes up with inventive ideas for props, scenery and costumes. Phil makes the most amazing things such as a folding 4 poster bed for ‘Scrooge’ as well as handling the lighting and curtains. Jean T finds and alters and makes costumes, she and Jean S used to work as a team and our sadness when Jean died was palpable, but now Diane is helping her as well as making tea for everyone. Jack always uses his voice to good effect as Stage Manager and shouts when attention is needed! Chris and Sue do a fantastic job with publicity and raffles. Chris designs the posters and front of programme and makes sure that our member Circuit churches get the publicity. We must not forget Stuart who recently has been sound supervisor as Chris has now taken to acting on stage. Recently I have been helped by Janet. She produced the potted panto in our last production and has been a great help to the little ones who have joined. Mandy Watkins has also expressed an interest in producing so I hope that between them some interesting times are ahead. Last but by no means least is Sandra without whom none of this would be possible. She and I have worked so well together over the years. She has played the piano so brilliantly in accompanying, filling in between scenes and playing solos when needed. I could not have managed without her. Some people ask which was our best production and I have to say without hesitation that the one that I was most proud of was the musical ‘Scrooge’ which we performed in 2008. Everyone played their part to make this special. The scenery, costumes and props were the very best we could have hoped for and the acting and singing excellent. It really did bring tears to my eyes on the last performance, as it did to many of the audience. 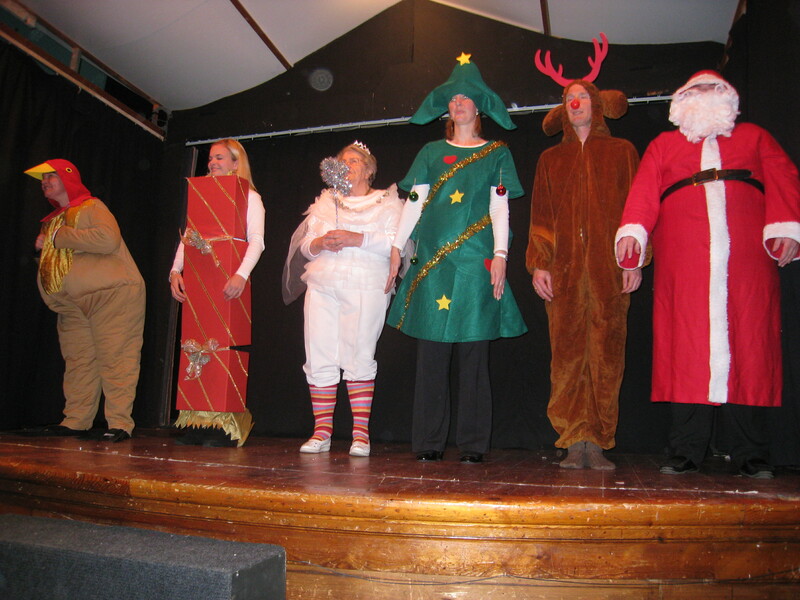 It is the mixture of ages and sizes that makes Theatre Club unique. It is a joy to see the enthusiasm of the little ones (they always know all the words) and the experience of the older ones who guide them, all working together on the stage to make a perfect ‘whole’ performance. My greatest hope is that Theatre Club will continue in the same spirit but with different people taking the reins. It will need co-operation and encouragement from everyone, but that is what Theatre Club does best, so let’s all look forward to the next 20 years.